As our summer Vintage Bathing Suit Exhibit continues this month, we are continuing to showcase Carolina Beach bathers. We hope you can come by our History Center and see our exhibit on Tuesdays, Fridays and Saturdays from 10 – 4 pm. 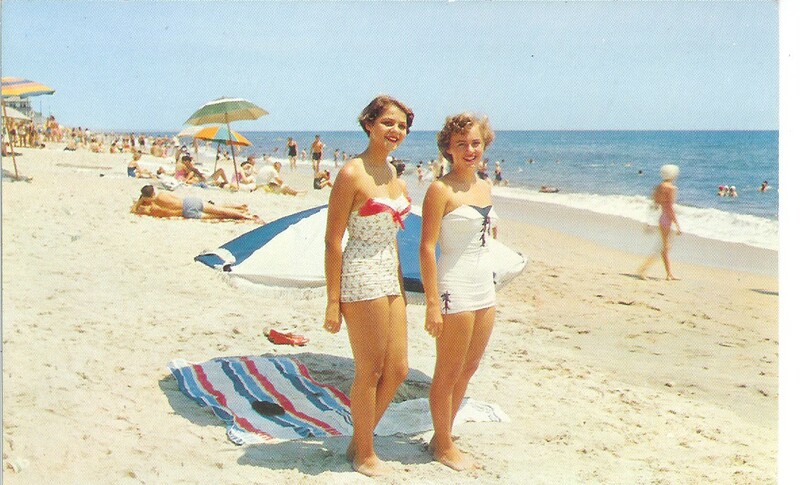 It was a beautiful day at Carolina Beach in the 1950s when local girls, Mary Frances All (left) and Sylvia Fountain (right), posed for this post card. The girls are wearing suits with the “modesty panel” in the front like many of the suits in our exhibit. They have chosen to take off the removable straps for a day of tanning without strap marks. Mary Frances shared with me that they were actually wearing each other’s suits that day. Most girls only had one suit each summer and tired of wearing the same one over and over so they often switched with a sister or friend. Mary Frances All was a Winter Park girl but she and Sylvia were best friends graduating from New Hanover High School together in 1957. Mary Frances was crowned Teenage Azalea Princess at Wrightsville Beach’s Lumina Pavilion during the Azalea Festival in 1956. She now provides a scholarship for the festival princesses. Mary Frances lives in Stanly, North Carolina, and is the widow of the late Dr. James S. Forrester who also served in the North Carolina Senate. Her son, Dr. James Forrester, Jr. is a cardiologist practicing in Wilmington. Sylvia Fountain was the daughter of Elmo and Plina Ritter Fountain. She was the granddaughter of W. G. Fountain who built the Fountain’s Rooms and Apartments in 1935 and the Royal Palm Hotel the following year in 1936. Both were in the first block of Harper Avenue. He also served three terms as a Carolina Beach Alderman from 1937 to 1945 and was mayor of Carolina Beach from 1945-47. In 1949 he founded the Bank of Carolina Beach and served as its first president. W. G. Fountain was one of the honorees inducted into the Carolina Beach Walk of Fame this past January, 2016. 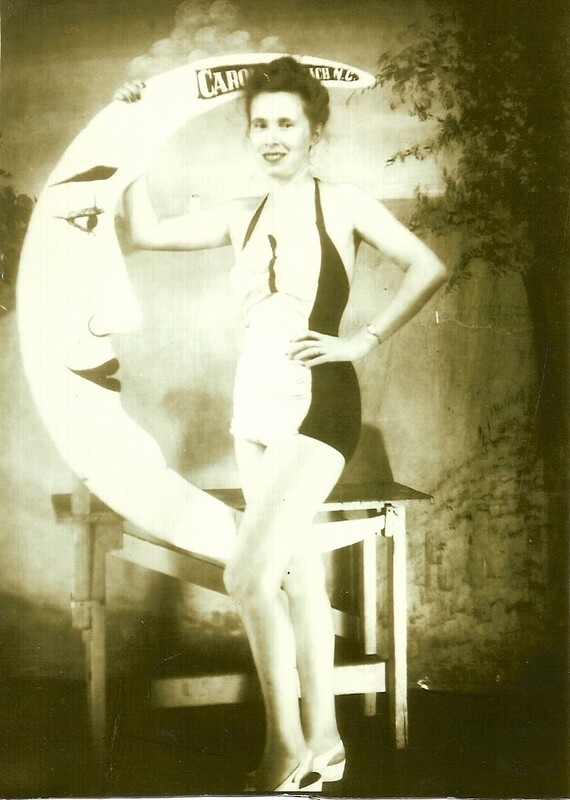 Sylvia’s mother, Plina Ritter Fountain (1916-2013), is posing in the Carolina Beach moon on the boardwalk in this photo from the 1940s. It is a little hard to see, but her black and white halter neck suit has a triangle shape cut out in the front just above the waist. These were the forerunners of two piece suits which were popular in the mid-1940s. Plina ran the Fountain’s Rooms and Apartments on Harper Avenue while her husband Elmo managed the Hotel Royal Palm next door. They were the parents of four children, Ray, Sylvia, Griff and Janet. Sylvia Fountain Logan passed away in 2008 in Fort Lauderdale, Florida; her funeral was held at Bethany Presbyterian Church on Castle Hayne Road. Her parents and grandparents are buried in Wilmington’s Oakdale Cemetery.